Shortage of resources is not the only obstacle most local independent short film filmmakers face, one of the keys to their success is to engage in international film festivals and to do effective networking with professionals alike – the question is, how? Rather than walking in the mist alone, why not join us in this programme to equip yourselves with information and strategies in planning for festival participation and to meet the like-minded in our creative community? Between 1977 and 1985 she made over 10 experimental short films. Since 1986 she has started creating single-channel video art and up till now she has made over 20 such works. Some of her works were shown in overseas and local exhibitions. She has also put video art into her installation and theatre work. She is also concerned about the development of digital arts. In 1994 she was awarded with the Asian Cultural Council fellowship to study video art in the States. In 1999 the Hong Kong Arts Development Council awarded her the Art Development Fellowship for video installation art. She has been a juror for the Hong Kong Independent Short Film and Video Awards for several years. Now she is an independent art worker for video art/administration/education/curating/ commentary. She is also an examiner of the Hong Kong Arts Development Council. She is now a consultant to HKICC Lee Shau Kee School of Creativity. This seminar hints you on preparing proper marketing and packaging of your short films for a specific group of professionals and audiences that are crucial to impress and succeed. Esther Yeung was born in Hong Kong. She graduated from The University of Hong Kong and attended schools in Beijing and Tokyo. Yeung has extensive experience in film distribution and international marketing. She was Festival Director & Programme Curator for The Hong Kong Asian Film Festival and was previously Manager of the Hong Kong Asia Film Financing Forum (HAF) at the Hong Kong International Film Festival Society. She joined Fortissimo Films in 2008, as Director of Marketing, Asian Acquisitions and Sales. She works with various producers and distributors on a library of 300+ films. Projects handled include NORWEGIAN WOOD by Tran Anh Hung, AIR DOLL by Kore-eda Hirokazu, WARRIORS OF THE RAINBOW: SEEDIQ BALE by Wei Te-sheng. Yeung recently joined Edko Films as Director of Marketing, Special Projects with a focus on distribution of high quality art-house films and award winning titles. Talk about techniques in establishing their fame: by arranging long-term filming projects with line-ups on marketing, by witty selections made on festival participations, by learning the balance and to gain support for their career – all keys to impress people all over the world. Wong Wai-kit Vicky graduated from the Department of Journalism and Mass Communication, Hong Kong Shue Yan University, then he attended London Film Academy in 2006. Wish, Valediction, Variable and The Decisive Moment are among the short films he has directed. 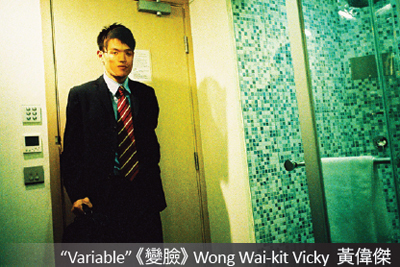 Variable has won the Excellence Award at the 31th JVC Tokyo Video Festival, the Special Mention at the 13th ifva Awards. The Decisive Moment has won the Best Cinematography at the Fresh Wave 2011, Local Competition, the Special Mention at the 16th ifva Awards and the Second Best Fiction Film at Mumbai International Film Festival 2012. The Decisive Moment also screened at The 14th Udine Far East Film Festival and Festival Paris Cinéma 2012. Back and forth, there is something different from before… I am surrounded by flowers… Summer is the season for love, and the time Chi Fan broke up with her lover. Trying to forget the sadness, Chi Fan came back to Hong Kong. She revisited the old places with her best friend, Kee Yin. The places seemed familiar but strange. They came across many happy faces. They talked about work, love and their lives. Traveling from one city to another, everyone is searching for something. Back and forth, we are only looking for a chance to starting over again. Feeling tired… performing different roles in front of different peoples… taking down the mask, I come to see… the Self has been lost in the performance of its social roles. Ten excellent short films listed under NAE that were previously showcased in international film festivals and competitions will be screened. Filmmakers will be invited to compare the local and international film cultures and share their experiences in impressing different types of audiences, laughs and tears of participating in different competitions and festivals. Remarks: Programmes are subject to change without prior notice. Programme content does not reflect the view of the organiser.